The World Says You’re Seen. Some songs show their value through sales; Billy Ray Cyrus grew wealthy from “Achy Breaky Heart” years before his daughter became a celebrity. Other songs show their value in resonance to the listener. “The World Says” is one of those songs, for me. The summer of 2007 found me traveling to Seattle to help my Uncle John. He had gone there to see if an experimental trial could arrest his mantle cell lymphoma. John endured two years of treatments and this was his last best hope. We met with nutritionists, therapists, and doctor after doctor to get him ready for the trial, but the cancer was too advanced to let him proceed. He was gone within four weeks. I did not find comfort in much at the time, but “The World Says” was therapeutic when I felt powerless. I am forever grateful to Karl for giving me that. Karl died this morning. If you did not know him, his modesty and kindness belied his talents. He spent more than a quarter century as a buyer at and owner of Pittsburgh’s best record store, enhancing the musical literacy of so many of us who lived in western Pennsylvania. Karl Hendricks was as much a civic leader of Pittsburgh during that time as anyone, without even considering the music he created. If you did not know his music, you can learn about some of the best rock music made the past quarter century and give some money to his family by purchasing his records from Bandcamp or Comedy Minus One. They are all worth it, from the cover art to the guitar playing to Karl’s lyrics. Karl’s writing is better than anything I can provide, so please listen to him instead of me. When he sold his store last summer, I posted a list of favorite songs of his and repeat that list now as entryways into his catalog. Thanks always to Karl. This entry was posted in events, Uncategorized on January 21, 2017 by Carl Zimring. Today, we observe the birthday of Dr. Martin Luther King, Jr. I want to observe this day with a reminder of Dr. Martin Luther King’s quest to ensure that all workers’ dignity be respected. This post includes material from Chapter 8 of my book Clean and White: A History of Environmental Racism in the United States. The Memphis sanitation workers strike is remembered most frequently as part of the series of events that led to Dr. Martin Luther King Jr.’s assassination in that city in April 1968. The site of that national tragedy, the Lorraine Motel, is now the home of the National Civil Rights Museum. Yet while Dr. King’s death is an understandably dominant aspect to the historical memory of the Memphis strike, historians, labor, and at least one national politician also focus, as Michael Honey’s magnificent book Going Down Jericho Road shows, on why the strike happened, and on its effects on labor, race, and the environment in the United States. The event that triggered the strike took place on February 1, 1968. Two workers, Echol Cole and Robert Walker, were on a garbage truck. By “on,” I mean they were riding on the back of the truck as was procedure in Memphis’s Department of Public Works. In a pouring rain, the two men tried to take cover as best they could by climbing onto a perch between a hydraulic ram used to compact the garbage and the inner wall of the truck. Somewhere along the drive, the ram activated, crushing the two men to death. One had tried to escape, but the mechanism caught his raincoat and pulled him back to his death. The deaths angered union organizer T.O. Jones, who called them “a disgrace and a sin.” In the days ahead, workers, local clergy such as James Lawson, and union activists mobilized to demand safer work conditions, better pay, and the right of union representation. When Echol Cole and Robert Walker died, a movement was born. In reality, though, those men’s deaths merely were the culmination of decades of subjugation, made worse by recent worsening of treatment by the mayor’s office. The subjugation was not simply of working people, but of African Americans. In Memphis, African Americans were the sanitation department — more than 1,300 black workers, some who grew up in the city, others who had left the crushing poverty of the cotton fields in Mississippi, picked up the garbage and yard wastes of all Memphians. Though the work was vital to the city’s well-being, it was dangerous, brutal, and ill-paying. The workers were not respected by their employers, or by many of the residents and businesses who benefited from waste removal. Aside from the hazards the trucks posed, sanitation workers had to handle all sorts of materials from tree limbs to broken glass to biological wastes that could infect, poison, or injure them. In the Memphis summers, this work was conducted under temperatures regularly exceeding 90 degrees often without shade or breaks to get water. Winter conditions were such that the risk Cole and Walker took in that truck seems understandable in context. Sanitation workers could be maimed at any time, and crippling injuries were common. Once disabled on the job, the worker had little recourse for compensation and was vulnerable to a life of poverty. This was work white people in Memphis considered beneath them. The city found this out the hard way when it tried to recruit whites to fill the jobs during the strike. In Memphis, the necessary, vital work of keeping the neighborhoods clean was not respected by the government, nor by most of the citizens. It was dirty work, done by inferiors as far out of sight and out of mind as possible. Even as garbage piled up, the city (and in particular the staunch anti-union Mayor Henry Loeb) demeaned the workers as infantile and disrespectful, treatment that inspired the proud, defiant strike slogan: I AM A MAN! It needed to be shouted, it needed to be repeated on hundreds of tongues and hundreds of signs. It needed to be said over and over, because it was believed by too few. Too many in February of 1968 took for granted and demeaned the people who made their lives better. As all residents of Memphis quickly learned, the work was necessary to their quality of life, and tensions rapidly escalated just days into the standoff. 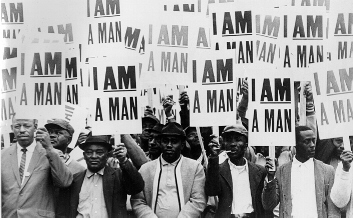 The strike quickly became a national focal point for labor activism and civil rights. Memphis’s churches and local NAACP chapter saw it as the launching point to address the systemic ills of segregation plaguing the city. The American Federation of State, County and Municipal Employees (AFSCME), caught by surprise by the sudden walkout, saw it as an opportunity to unionize municipal workers in a city that had resisted unionization. 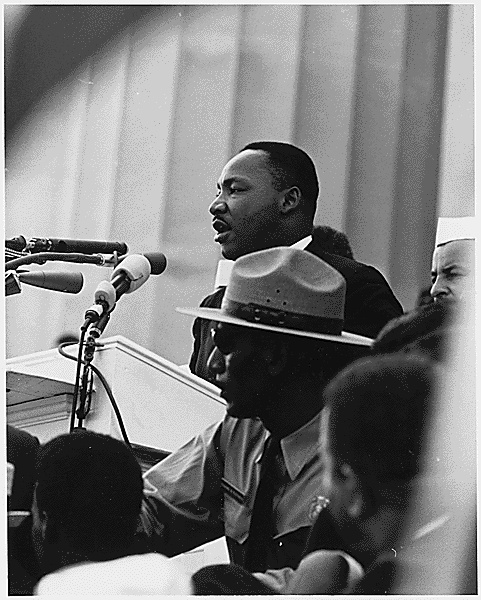 Dr. King saw the strike as an ideal forum for his Poor People’s Campaign, as he had in recent months pushed the notion of economic opportunity as crucial to the realization of civil rights now that voting rights had received federal protection. The timeline of events in the strike that lasted from February to April is too rich to recount in a diary: AFSCME has a brief chronology online, but a true appreciation of the diverse interests and activists brought together in Memphis requires a longer read. I recommend (again) reading Michael Honey’s Going Down Jericho Road to gain an appreciation of why thousands of people in Memphis and nationwide mobilized as a result of the strike. It is as engrossing and moving as any American history book I have read in the past decade, and Honey articulates why so many people were spurred to take action despite the risks. The labor action that resulted faced many problems. The local media, sympathetic to to the mayor, branded the strikers as shiftless and Communist. The city’s refusal to negotiate sparked a consumer boycott of Memphis businesses, and as tensions escalated, so did the city’s willingness to suppress the movement with violence. A march on March 28 was broken up with violence and tear gas, leading to the death of a 16-year-old boy named Larry Payne at the hands of the police. Dr. King’s reputation suffered because of this march with critics mocking his calls for nonviolent activism as hollow. Picketing continued after the march was broken up, but under conditions that belied America’s reputation as a free society. The city’s stance against the strike was literally militant, forcing picketers to march in single file in the wake of overwhelming security. The issue is injustice. The issue is the refusal of Memphis to be fair and honest in its dealings with its public servants, who happen to be sanitation workers. Now, we’ve got to keep attention on that. That’s always the problem with a little violence. You know what happened the other day, and the press dealt only with the window-breaking. I read the articles. They very seldom got around to mentioning the fact that one thousand, three hundred sanitation workers were on strike, and that Memphis is not being fair to them, and that Mayor Loeb is in dire need of a doctor. They didn’t get around to that…. Now, let me say as I move to my conclusion that we’ve got to give ourselves to this struggle until the end. Nothing would be more tragic than to stop at this point, in Memphis. We’ve got to see it through. And when we have our march, you need to be there. Be concerned about your brother. You may not be on strike. But either we go up together, or we go down together…. And then I got to Memphis. And some began to say the threats, or talk about the threats that were out. What would happen to me from some of our sick white brothers? Well, I don’t know what will happen now. We’ve got some difficult days ahead. But it doesn’t matter with me now. Because I’ve been to the mountaintop. And I don’t mind. Like anybody, I would like to live a long life. Longevity has its place. But I’m not concerned about that now. I just want to do God’s will. And He’s allowed me to go up to the mountain. And I’ve looked over. And I’ve seen the promised land. I may not get there with you. But I want you to know tonight, that we, as a people, will get to the promised land. And I’m happy, tonight. I’m not worried about anything. I’m not fearing any man. Mine eyes have seen the glory of the coming of the Lord. We know what happened the next day. When Americans hear the words “MLK” and “Memphis” together, minds inevitably turn to the details of Dr. King’s death. Too often, though, we forget what Dr. King was doing in Memphis (and that his death effectively ended the strike as the city recognized the union’s right to exist in the wake of the overwhelming grief and rage that gripped the nation). We forget how the events of early 1968 reflected his concerns not just at the end of his life, but how they represent what he had fought to accomplish in the previous decade and what challenges remained for Americans that April. Today, the Memphis strike is part of the lexicon of American politics. AFSCME proudly places the strike in a central place in the union’s history, as its website indicates. The union’s depiction of this part of its history puts workers in the forefront of the history of the civil rights movement, and civil rights activists in the forefront of the labor movement. As David Roediger has discussed, such a relationship was not always possible in American history, but it is part of the dream Dr. King explicitly hoped for in the weeks before his death. In the middle of the last century, on the restless streets of Memphis, it was a group of AFSCME sanitation workers who took up this charge. For years they had served their city without complaint, picking up other people’s trash for little pay and even less respect. Passers-by would call them “walking buzzards,” and in the segregated South, most were forced to use separate drinking fountains and bathrooms. 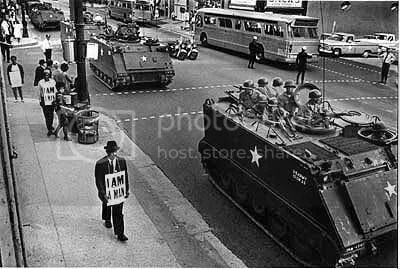 But as the civil rights movement gained steam and they watched the marches and saw the boycotts and heard about the passage of voting rights, the workers in Memphis decided that they’d had enough, and in 1968, over 1,000 went on strike. Their demands were simple. Recognition of their union. The right to bargain. A few cents more an hour. But the opposition was fierce. Their vigils were met with handcuffs. Their protests turned back with mace. One march was interrupted by police gunfire and tear gas, and when the smoke cleared, 280 had been arrested, 60 were wounded, and one 16-year old boy lay dead. And still, the city would not give in. Now, the workers could have gone home, or they could’ve gone back to work, or they could’ve waited for someone else to help them, but they didn’t. They kept marching. They drew ministers and high school students and civil rights activists to their cause, and at the beginning of the third straight month, Dr. King himself came down to Memphis. At this point, the story of the sanitation workers merges with the larger saga of the Civil Rights Movement. On April 3rd, we know that King gave his “I’ve Been to the Mountaintop” sermon. On April 4th, he was shot and killed by James Earl Ray as he stood on the balcony of the Lorraine Motel. And on April 8th, a day before he was buried, his wife Coretta led the sanitation workers on one final march through the city of Memphis – a march that would culminate in the union contract that the workers had sought for so long. This is the legacy you inherit today. It’s a legacy of courage, a legacy of action, a legacy of achieving the greatest triumphs amidst the greatest odds. It’s a story as American as any – that at the edge of despair, in the shadow of hopelessness, ordinary people make the extraordinary decision that if we stand together, we rise together. What those workers made real in Memphis – and what we have to make real today – is the idea that in this country, we value the labor of every American. That we’re willing to respect that labor and reward it with a few basic guarantees – wages that can raise a family, health care if we get sick, a retirement that’s dignified, working conditions that are safe. Today, forty-eight years after the strike, its imagery has been embraced by our president. Though demonized by the municipal government in Memphis, and investigated by the police and FBI, the power of the movement in the streets has influenced those seeking power in the halls of Washington. Despite AFSCME’s efforts and this rhetoric, much work remains to ensure “wages that can raise a family, health care if we get sick, a retirement that’s dignified, working conditions that are safe.” Today, people of color continue to make up a disproportionate amount of the labor force handling Americans’ waste. Though most communities do not have equipment as dangerous as the truck that killed, the work remains fettered with hazards. Too often we keep the people who do this important work out of sight and out of mind. It is altogether too common that the waste facilities we use taxpayer money to build and manage, whether they are garbage incinerators, sanitary landfills, hazardous waste dumps, or recycling sorting facilities, are placed in communities of color where not only the workers who handle the hazards of disposal are affected, but the sounds, smells, and toxins that may be released affect neighboring residents. Though the strike in Memphis addressed several concerns, many of the injustices that led to the strike are common aspects of the American landscape, years after all of the strikers have retired, and many — including T.O. Jones, who died too young in 1981 — have passed away. Moreover, contempt for the people who perform the dirty work necessary to keep our streets, homes, and workplaces endures. This week, Donald Trump will be sworn in as President of the United States. During one of the 2016 presidential debates, Hillary Clinton raised Trump’s insult of Latina beauty pageant winner Alicia Machado as “Miss Housekeeping” as an example of his intersectional bigotry towards women and Hispanics. That Trump demeaned Machado by associating her identity with domestic cleaning work reveals the power of how work, whiteness, and waste have intertwined in American society. The events in the presidential elections that brought the United States’ most explicit symbol of white identity politics to the White House show the enduring influence of white supremacy on how we see and shape our waste management practices. Sixty-three million Americans voted to elect Trump president despite his overt racism. Trump’s words are crude, but reflect how expressions of white identity in the twenty-first century result from how we have normalized waste work as nonwhite work over the past two centuries. Confronting this history is an important step in dismantling the enduring structures of environmental racism. The injustices are still in place today, but one change over the past forty-nine years is a recognition of how widespread those injustices are. Fourteen years after Memphis, an African-American community in Warren County, North Carolina decided it would not stand for a PCB dump to be placed next to their homes and they laid down on the road in front of bulldozers to prevent the digging. These Americans made history as the first people in the United States to be arrested preventing the construction of a dump. The residents of Afton, North Carolina failed to prevent the dump’s siting, but in the months and years that followed, the environmental justice movement emerged to fight back against the decades of discrimination that made shunting the dirty work of garbage collection to blacks “normal” in Memphis. The rhetoric and tactics used in the Memphis strike influenced the activism of the environmental justice movement. Though that movement has evolved and grown over the past quarter century, it owes debts to the sanitation workers who decided that enough was enough in February of 1968. Today, let us remember that forty-eight years ago, several hundred such people rose up for respect, for dignity, and for a more just society. Let us remember the sacrifices of Dr. King, yes, but also of Echol Cole, of Robert Walker, of Larry Payne. Let us remember the courage and resolve of T.O. Jones and every preacher, every union member, every activist, and every person who worked to bring a measure of justice to Memphis. Let us remember, and let us try to use their example to make our own communities more just today and in the days ahead. This entry was posted in Clean and White, environmental racism, history on January 16, 2017 by Carl Zimring. Coming in 2017: Aluminum Upcycled. This was a fun book to research, allowing me to combine discussions with my colleagues at Pratt with explorations of many “covetable” goods, including furniture by the Eames Office, Herman Miller, and Emeco, vehicles by Ford, Honda, Porsche, and Aston Martin, and guitars by Travis Bean, John Veleno, Wandre Pioli, and Kevin Burkett’s Electrical Guitar Company (among others). I plan on giving a few talks about the book this spring. If you would like to schedule one, contact me at czimring “AT” pratt “DOT” edu. This entry was posted in Aluminum Upcycled, consumption, history, publications, upcycling on January 2, 2017 by Carl Zimring.